I’ll admit that the movie made me do it. I decided I wanted to read some Iron Man. I never have before, and I didn’t know if it made sense to start at the beginning, so I just decided to see what was at the library, and read some of that. 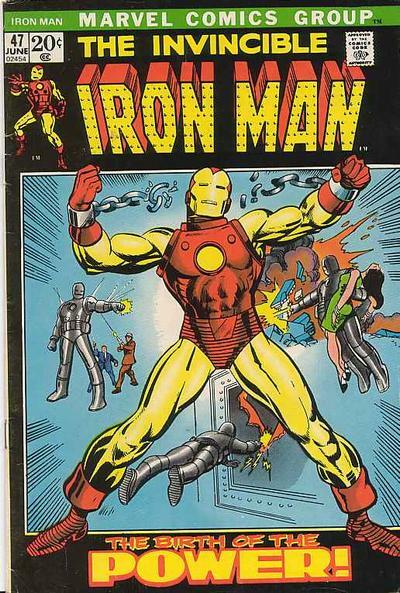 There I found the collection The Many Armors of Iron Man , which starts with this comic, Iron Man #47. Much to my surprise, when I cracked open the TPB, I discovered that this is the comic that tells the first part of the story from the movie! I looked for some sign that the trade was simply a movie tie in, but I didn’t see any. I’m sure I could probably dig online here and find some indication of whether this book was published before or after the script for the movie, but it probably doesn’t matter. It tells Iron Man’s “origin story”, so it’s a natural choice to base a movie after. Difference: Comic is set in Vietnam, movie is set in Iraq Afghanistan. Difference: In the comic book, Tony Stark is selling the military tiny but powerful transistors when he is wounded and captured. In the movie it’s missiles. Similarity: Tony Stark is wounded and has shrapnel in or around his heart. In the movie his humvee is attacked, in the comic he walks through a trip-mine. Difference: In the movie, the leader of the terrorists is “Raza” (although Mike speculated that it might have been a character called The Mandarin, who is Iron Man’s archenemy in the comic books. Mandarin’s source of power is his 10 Rings, and in the movie we see Raza fiddle with his ring rather prominently, and also his terrorist group is called the Ten Rings). In the book, the leader of the “bad guys” is someone named Wong-Chu. I have no idea if Wong-Chu is a returning character. Both: In both the book and movie, Stark is helped to create his first iron suit by a Dr. Yinsen. In the comic, Stark recognizes Yinsen as a great physicist. In the movie, Yinsen recognizes Stark (as a celebrity inventor), Stark doesn’t recognize Yinsen at all. Difference: In the movie, Stark has to have a magnet recessed into his chest to keep the shrapnel from entering his heart. In the comic the device that saves him is somehow just part of the armor. Similarity: In both comic and movie Yinsen sacrifices himself to give Tony extra seconds for his iron suit to be ready for action. In the comic, this is a completely selfless and heroic act. In the movie, he runs recklessly down a hallway, shooting way above the terrorists heads, fully intending to get himself killed so he can join his family (who are all already dead). Both: In the comic, one of the “features” of this suit of iron is that it has suction cups strong enough to hold it to the ceiling. Ridiculous. Also, in the book he uses this ability to hide from rather than fight his captors (although then on the very next page he is fighting them, so I don’t really know why–maybe just so he could stick to the ceiling like spider man). Difference: In the movie, Iron Man mock 1 has flame throwers. In the comic, he has a miniature buzz saw in his index finger, a magnetic repulsor ray, and can squirt a thin stream of flammable oil. Similarity: He uses these (flame throwers/flammable oil) to blow up an enemy ammo dump. Difference: In the comic, this is not an ammo dump made up of Stark Industries products. First of all, I already knew before reading it that the book was set in Vietnam rather than Iraq Afghanistan. It makes a kind of sense to change it though. There are many parallels between the two “conflicts”, and since the movie is supposed to be set in the present, Iraq Afghanistan is a logical choice. Finally, there is no mention of Obadiah Stane in this issue. It is just bad luck that Tony Stark falls into the terrorist’s hands in the beginning. Oddly enough, however, also contained in this collection is issue #200, which does contain Obadiah Stane, and also his transformation into Iron-Monger. I read that story too, but it’s a less literal translation from the comic. Just about the only similarities are the fact that Stane based the blueprints for his suit on stolen blueprints from an old Stark suit, and then made major modifications to it. There is a big battle, one in which Obadiah makes liberal use of hostages to keep Iron Man at bey, and then when none of that works, actually kills himself rather than allow Tony Stark the happiness of “winning” the battle. There you have it. I’m sure there are other more detailed analysis out there, but I’m by no means an Iron Man expert. This is pretty interesting stuff. These older comics are written in a very over the top style that is pretty fun, but I can imagine getting sick of it rather quickly. I’ll definitely be reading more Iron Man, but I may stick to small doses for now. This entry was posted by Martin	on Monday, May 12th, 2008 at 10:35 pm and is filed under adaptations, issues, Marvel, movies, TPBs/graphic novels. You can follow any responses to this entry through the RSS 2.0 feed. You can leave a response, or trackback from your own site. Keep in mind the comics were written when the Vietnam war was current…Hollywood just updated the location to Afghanistan to make it logical to the current audience (and war). The “Origin” story has been retold several times (or referred back to in abbreviated flashbacks) several times over the Iron Man comic history – I think they did it to “fill in the backstory” to new readers. I understand the need (not everyone is going to go out and buy all the back issues to a comic in order to understand the character’s past), but have always kind of viewed it as “filler”. If you (or anyone) really wants to read the Iron Man “story” without spending a fortune on back issues, you can pick up the “Iron Man Essentials” books. 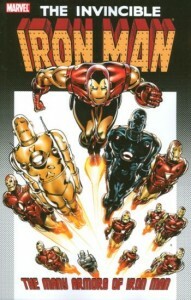 They are black & white reprints of the original Iron Man comics starting with his first appearance in “Tales Of Suspense”. Currently there are 3 volumes of Essential IM…about $20 each – available at most local comic book stores. I loved the reference to the “Ten Rings” in the movie! Even though the Mandarin is Iron Man’s greatest enemy in the comics, I’ve never fancied the idea of a Man of Technology fighting with a Man of Alien Magic (okay, Alien Tech…but ten rings giving powers?!?! You’d lose the audience’s belief in a heartbeat…). I’d love it if in the sequel(s) they expose the Ten Rings as some sort of giant international terrorist group headed up by a power-hungry Chinese warlord calling himself “The Mandarin”. hee-hee! The movie is set in Afghanistan not Iraq. Personally, if Ironman was a straight comic to movie film like 300 was (the frames were the story boards) I wouldn’t have seen it. 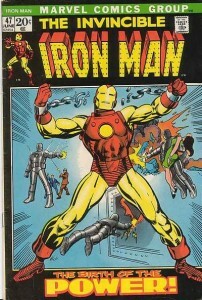 The original Ironman comics are too dated for my entertainment interests.